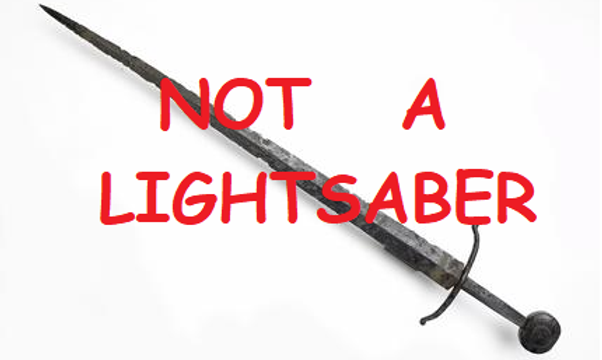 The sword is not a lightsaber. A common-sense fact, and yet I'm amazed at how people often treat a sword like it is. I have nothing against lightsabers, I've been to, and will be going back to, a lightsaber convention to teach about Historical European Martial Arts and the use of the sword - be it plastic, metal, or crystalline energy. Where I wish to clarify what a sword is and is not, comes from my experiences. First, for years I have done HEMA demonstrations and seminars and some of the techniques, time and again, draw surprised gasps from the audience. Second, in my various videos, some of the techniques have gathered skepticism, even outright rage and commentary in entirely all capital letters. Both issues arise from the general misunderstanding of exactly how sharp a sword is, and the fact that a sword is not a lightsaber. 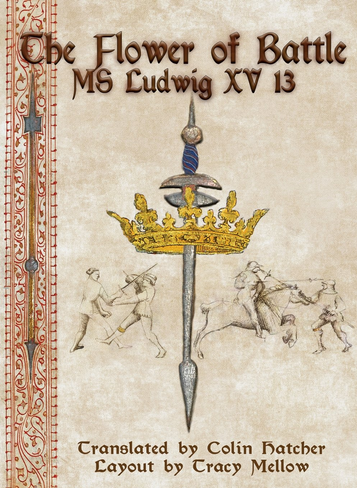 We will be looking at the longsword and its equivalents today, rapiers and sabers deserve their own article at a later date. The first thing to consider is that clothing can and does act as a defense against the cut of a sword, no matter how sharp it is. Someone very skilled, and prepared, can cut through layers of fabric- but it is not easy. Furthermore, in a combat situation, the target is unlikely to be stationary and is likely fighting back, making the cutting of a person's clothing even more difficult. The clothing in question is not your standard cotton t-shirt, but rather the clothing worn in the 14th through 17th century. 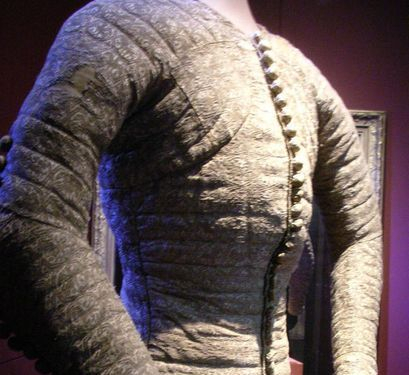 A doublet (also given many other names with dizzying variations I will dispense with) was a padded jacket commonly worn by Europeans from the 14th to 17th century. These doublets are far stiffer and more resilient than today's cotton t-shirts. A doublet can protect its wearer and they include all manner of ways to increase personal safety. Doublets had sewn ridges, multiple layers, and even integrated links of metal chain to keep the wearer safe. "There is talk here how you and Howard fought together on the shire and that one of Howard's men struck you twice with a dagger, and so you would have been hurt but for a good doublet that you had on at that time. Blessed be God that you had it on." There is one surviving 14th century doublet called the pourpoint of Charles de Blois. Charles was killed at the Battle of Auray in 1364, but his garment was preserved as a holy relic. The doublet was for a Duke of considerable wealth and power and so his doublet can be considered the very best of the era. It is padded with cotton and silk and has various cuts so that its brocade and satin would have fit tightly about the Duke's body- so much so that it is not a garment that could be put on without assistance. 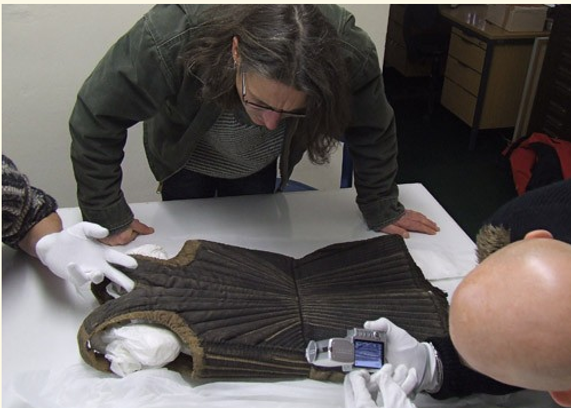 The German HEMA group Hammabourg gained access to a padded jacket from the mid 15th century from the Lubek museum. This jacket had rust stains on the front, indicating it was worn beneath metal body armor. The jacket is well padded and would have provided excellent protection from attack as well as acted as a cushion for the armor worn over it. The image depicts the back, while the front is missing large sections. The thickness of the padded jacket is clear to see, and the ridges provide further strength and protection to the wearer. Such fabric-armor was commonplace throughout Europe. By the 16th century, doublets were still worn and the more expensive ones were, like Charles' pourpoint, fitted to the body and the wearer would require assistance in dressing. 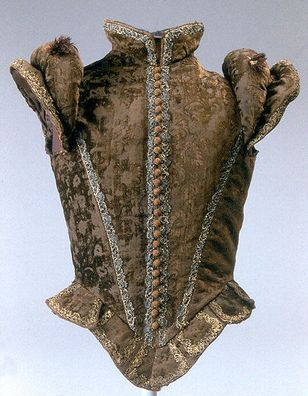 This European doublet from 1570-1580 includes stiff fabric, padded shoulders and metal worked into the fabric. Its primary purpose is not defense, but one of fashion. That said, it has a defensive value to it as noted with the account of an English son thankful his father was wearing one when he was stabbed twice with a dagger. The layers, interworked metal, ridges and padding made doublets the equivalent of bullet proof vests of the 14th to 17th century. Such attire was commonly worn because the city streets were dangerous and travel was even more so. Jacob Fugger, the richest man in the Holy Roman Empire in the early 16th century was at one point considering leaving Augsburg due to unrest. However, rich as he was, powerful as he was, he was deeply worried about even a short distance trip. Bandits and robber knights were common place and he knew he would be a target. Even priests were at times given permission to wear armor and carry weapons when traveling on the unpoliced roads! In Florence, the murder rate in 1400 was double that of America's most dangerous city today. In short, people walked around wearing armor- just not necessarily constructed out of metal. This armor provided protection from cuts and even thrusts. Swords, even very sharp ones, won't necessarily go through a person easily, especially if they are wearing body-armor. Even a hat might protect a person, and the hats of the day were, like the doublets, often made up of layers of cloth. Thus, swords are not lightsabers. They need sufficient power and structure to cut through the cloth armor that was commonly worn. That's not even accounting for the skin, muscles and bones beneath! Another reason swords are not lightsaber is that you can grab them. Fiore de Liberi's Flower of Battle shows numerous techniques in which the sword is grabbed. The art depicts the use of the bare hand in doing so, while Fiore's own account of his five unarmored duels indicate he was not entirely without protection. He had on a jacket and was wearing gloves. In 2013, John and I decided to try and test the ability to grab a sword with the bare hand, the idea being, if it could be done with the bare hand, a glove would make it all the easier. The video above, Catching Steel, demonstrates how a sharp sword can be grasped, and rather firmly at that. Because we wanted to be safe, we were not going crazy- but the point is clearly made. You can grab a sword, even a very sharp one, with minimal risk. The reason this is possible is because the grabs Fiore shows are done from the bind. When the sword is not moving it is both, able to be grabbed and unlikely to cause damage. The broad blade allows for a secure grip along the flat surface and even if someone yanks and pulls, a firm grip can stay latched on. With a bare hand this can be done, and with a padded glove, it is all the easier. The sword is not a weapon that in combat can last forever. A sword, even sitting in a scabbard and jostling about can lose its edge. Swords are tools and when they are used, they are used up. Against each other they will chip and stick, as if slightly magnetic. 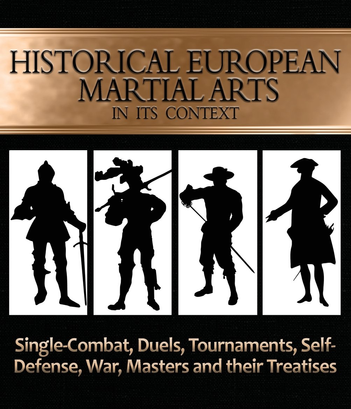 This generally would not matter in the context of a duel, the most common context of all the HEMA source material. While blades are damaged by striking against one another, duels tended to be short and if a cut wouldn't do- a thrust certainly would. In a war-setting, it was standard practice to carry multiple weapons. A 17th century Polish Hussar for example had a lance, a heavy long blade and a saber, as well as daggers and perhaps even a pistol! 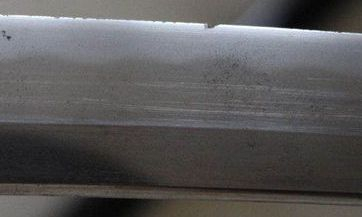 So, while a sharp sword can damage another sharp sword, in context- this was likely not a major factor and as mentioned prior, hours in the scabbard was more likely to dull a blade than a duel. A sword is not a lightsaber, and it has to be seen in context. Longswords, for example, were generally not used by people against one another unless they were wearing some form of armor, including clothing as a form of armor. This means a cut, to be successful, must either strike an unarmored part of the body, or, it must strike an armored part and have the power and structure to be sufficient. If that armor is metal, there's no cutting through it, and if it is cloth, it may not be easy. As an experiment, I was with some powerful cutters who struggled to cut through fabric on a gel-target. These cuts were well structured, the blades were sharp, but perhaps not enough and they just couldn't easily get through. Sheer impact was enough to be clearly damaging, but the cut just wasn't happening. These were not novices to cutting. I of course am not the greatest of cutters and had to satisfy myself with using the sword as a crowbar. Different blades were tried, and some did better than others, and overall it was agreed that- yes, it would be possible with some practice to get good at it- but in a fight, it would prove difficult. This may be why in Polish sources, duels were about striking the face and hand- two unarmored targets. In Fiore's Flower of Battle, few cuts are shown hitting a target, those that are, are striking the bare head. In sparring, this means light and insufficient cuts should be treated with suspect. This has to be agreed upon by the sparring partners because the last thing you want is two people escalating their power because they think nothing but the most powerful blow should be accepted. On the other hand, a scrape to the arm, or a weak cut from below to the body isn't something to treat as mortal, or even effective. Good communication between sparring partners is the best way to determine what is and is not sufficient. Thrusting with a sword is a different matter. Using the same experiment as before, we attempted thrusts with a variety of weapons against a gel target wearing cloth armor. It was ridiculously easy to do with just about any weapon with a point. While a weak cut can likely be discounted, a thrust is a different matter. We have an account of a doublet preventing two thrusts of a dagger, but, if one had to get through cloth armor, the thrust is easier than the cut. History lends itself to our own efforts today. 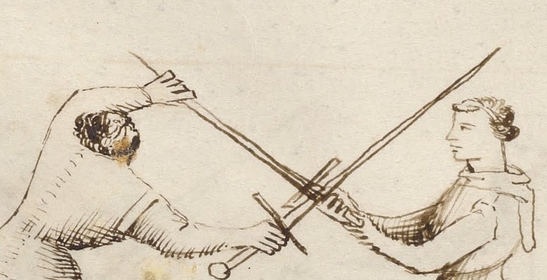 In the 1300s, longswords had broad, effective cutting blades. As armor, metal or otherwise, improved and became more common, longswords adapted becoming thinner and longer, getting better at the thrust. This was necessary, because swords are not lightsabers. Fabric can stop them. They can be grabbed. They can lose their edge. All of this is reinforced by HEMA source material, and yet, I expect at my next seminar when I show Fiore's technique of grasping a blade, someone in a Tap-Out shirt will cross his arms and give me a long look. The stories and history behind the HEMA.